⍟ What is an Insurance FMO / Insurance IMO? At the most basic level, a Field Marketing Organization (FMO) or an Insurance Marketing Organization (IMO) is a company that offers insurance products and services to insurance agents or agencies. Most FMO’s will normally offer services above and beyond insurance products, but the services offered will vary by company. We will review some of the products and services you should look for, as well as important questions to ask, before you start working with an FMO. 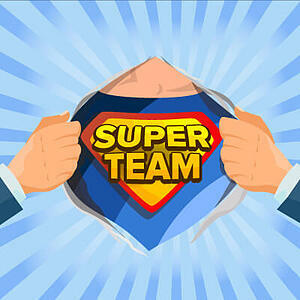 Like with any business, having the right support can help supercharge your success. | " Think of an FMO as Your Sidekick for Success." ⍟ Do I Need an FMO to Get Contracted Through a Carrier? While there are a small handful of carriers that will contract agents directly, the vast majority of name-brand, competitive insurance carriers will require you to work through an FMO to obtain their products. In general the ability to work directly with the carrier, if available at all, will be challenging as they prefer to contract with agents or agencies that can meet certain profitability objectives. An FMO can offer contracts to agents that they might not be able to acquire individually. They can do this because of the volume and relationship the FMO has developed with the carriers. This puts an FMO in a unique position to have a quality selection of products to offer agents. A good FMO will work consistently to get the best contracts with top companies, and offer them to agents and agencies of all sizes. They should be a pillar of support, helping you maximize your efforts, and allow you to focus on supercharging your business. Some FMO’s will offer full, vested commissions on your sales. You would not get paid any more if you were contracted directly through the carrier, even if it were available. In addition to vested commissions, you may find additional benefits with an FMO versus going direct. An Independent Agent is not an employee of another agency. They are free to contract with any company they feel is a good fit for their business. They are their own boss, they set their own hours, and choose the products they want to go to market with. An Independent Agent has more freedom to choose how they do business and will enjoy a higher commission on his contracts. A Captive Agent works for a company or agency. They are required to take on the products chosen by the company they are employed with. Typically, Captive Agents earn lower commissions than Independent Agents, but receive more support. Nevertheless, the added support and training they receive will come at the cost of lower commissions. Regardless of whether you end up contracting as a Captive or Independent Agent, make sure to fully understand the Release Policy of the FMO you choose. If at any time you want to part ways with the FMO, you simply ask for a release, stop working with the company, and still retain your book of business. There are some good FMO's out there that will offer a straight up release policy with no strings attached. This type of relationship will allow the most flexibility with your business. This relationship allows agents to operate like a business and not get locked into something that may not be in their best interest. Other FMO’s offer limited release options, which may not allow an agent to be released easily, or won’t allow an agent to retain their book of business. This means that the business the agent generates while working with a company, should they decide to leave, may belong to the FMO and NOT the agent. Note! It is essential to be clear on this point before selecting an FMO! Some FMO's will have strings attached to a release policy that may not be in favor of the agent. Make sure to ask about their release policy and understand it completely before contracting with any FMO. FMOs generally provide agents and brokers access to a CMS (Centers for Medicare & Medicaid Services) approved quoting tool. This will enable you to quote Medicare Advantage Insurance Plans (Medicare Part C), Medicare Supplement Insurance Plans (Medigap Policies), and Medicare Part D Prescription Drug Plans. Ask the FMO if their quoting tool offers full disclosure and is not filtered or hiding carriers from your view. This is important if you want to get a complete view of the market. FMOs that want to help you compete more effectively will usually offer customer relationship management (CRM) tools. This software will help you keep track of your client from first contact through enrollment, and offer a calendar and reminder system to ensure you know what you need to do – daily, weekly, and monthly – to help you build your business. FMOs offer a range of products to help you build the perfect portfolio, ensuring you remain competitive in your market space. A strong FMO will generally offer agents and brokers with a wide range of product options, including regional and national health plan options from brand name carriers with highly ranked plans. Help getting your required annual sales certification (or re-certification) from AHIP (America’s Health Insurance Plans) and Product training for your contracted carriers. While certification for specific products will be required no matter which FMO you work with, some will offer reduced rates for required AHIP training. A good FMO will notify you when new certifications are available each year. Experienced support is a must for an insurance agent. A good FMO will have an experienced team with deep industry and product knowledge along with the understanding of being an agent in today’s marketplace. Many may be or have been agents themselves. The company should assign you to a marketer that will treat you like a business owner and a partner, and have your success in mind. A good FMO knows that they are successful only when the agents they work with are successful. Make sure to align yourself with an FMO that will give credit where credit is due. Ensure the company will provide a commission level that will increase as your production increases. You work hard to grow your business, and an FMO should recognize your efforts with "upper level" contracts for you to grow into. How long has the FMO or IMO been in the insurance business? Are you interested in being an Independent Agent or a Captive Agent? Will the FMO assign you a specific representative or marketer to deal with? Will the FMO pick up the phone or respond promptly to email when you ask for assistance? Does the FMO have expedited contracting? Does the FMO offer an open release policy? Does the FMO offer online tools to help you operate more efficiently? Does the FMO provide a variety of product lines (i.e., Medicare, Life Insurance, Supplemental, Dental & Vision, etc.)? Does the FMO help to provide reminders for licensing and appointments? Does the FMO help with commission and production audits? Does the FMO offer any form of lead assistance? Is there room for growth in your contracts and commissions? Will you be vested from day 1 in your business and commission? If your potential FMO offers most, or all of the above, ask if any of your associates are already doing business with them. The best reviews come from people currently working with an FMO, who can share their experience and quickly help you determine if it’s a proper fit. It’s also a good idea to speak with a rep from the FMO to get an idea what kind of support you will receive, and to get a feel for the attitude of the employee. Try to get an idea of the turnover rate at the company. A good FMO will usually have a core of experienced marketers that have been there for years. Choosing an Insurance FMO is like choosing a business partner, and having support outside of the insurance carrier is important while building a block of business. It's important to ensure the FMO will be providing the best products and services for your business. Even a superhero needs support from time to time. A good FMO can provide that kind of support. Just make sure you do your homework and ensure they have your best interest in mind. We hope you find the right partner that will help you supercharge your business! Precision Senior Marketing helps Senior Insurance Agents around the country go from Ordinary to Extraordinary. We take pride in providing our agents with high quality senior insurance products and services that will help grow their business, and bring a sense of security and peace of mind to the nation's senior population. Want PSM To Be Your Sidekick?